Contrast is produced when we combine colours from opposite sides of the colour wheel. Harmony is produced when we combine colours from the same side of the colour wheel.. Looking at these two portraits (by Jawlensky and Karl Schmidt-Rottluff), draw a copy using analogous colours and draw another one usingcontrasting colours. Use wax crayons. Oil on Canvas, 72 x 92 cm. 1889. 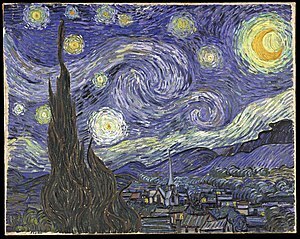 The Starry Night was completed near the mental asylum of Saint-Remy, 13 months before Van Gogh’s death at the age of 37. Vincent’s mental instability is legend. Van Gogh painted furiously and The Starry Night vibrates with rockets of burning yellow while planets gyrate like cartwheels. The hills quake and heave, yet the cosmic gold fireworks that swirl against the blue sky are somehow restful. This painting is probably the most popular of Vincent’s works. We are going to use this picture to make our painting with wax colors. First of all we must paint the surface with colour and then cover it complety with a black wax.We have to grab the last wax layer to take out the colours. At the end of the process we should laminate the work with latex. Take a look at the results!! !